HARTFORD, Conn.--(BUSINESS WIRE)-- The Travelers Companies, Inc. (NYSE: TRV) today announced 11 new states where eligible customers can access discounts on smart home kits through the insurance industry’s first digital storefront on Amazon: Amazon.com/Travelers. The additional states are Alabama, Arizona, Connecticut, Idaho, Illinois, New Jersey, New Mexico, Oregon, Tennessee, Texas and Utah. Home insurance customers in these states can also receive a free Amazon Echo Dot from Travelers — even without the purchase of a kit — subject to program terms. The discounts and free Amazon Echo Dot were initially available to Travelers home insurance customers in California and Travelers Quantum Home 2.0 customers in Colorado, Missouri and Wisconsin. Motion detectors with multi-sensor capabilities. A smart home hub that wirelessly connects a wide range of smart devices and enables them to work together. Eligible Travelers home insurance customers can receive a discount on their policy with the purchase of a smart home kit. Discounted kit installation through Amazon Smart Home Services is also offered where available. 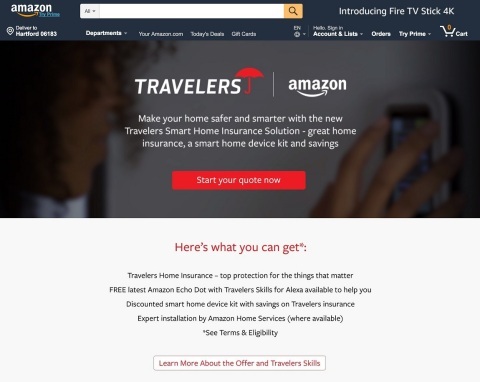 Travelers also recently introduced new Alexa skills: the “Travelers” skill, which assists the company’s home insurance policyholders with questions regarding billing and payments; and the “Travelers Home Central” skill, which enables all consumers to access property maintenance and home safety tips. For example, “Alexa, ask Travelers when is my bill due,” or “Alexa, ask Home Central for a fall home maintenance tip.” The company plans to add to its Alexa skills over time. For more information, visit the Travelers digital storefront at Amazon.com/Travelers.